Google Play Store generally does not allow you to download Android apps apk files directly into your PC or computer from their android store. But they let you to select app and command to install directly in y0ur android device. Generally one does not need to download android apps in pc but due to some reasons you may want to download android apps in your computer then here I will show how to download android apk directly in your pc easily. There are many ways to download apk files like downloading from file sharing sites. Many websites gives links to download apk files for most of apps but always there is a risk of malware or modified version which may harm your device. So you must play safe with this apps. Thus it is better to download directly from the play store. 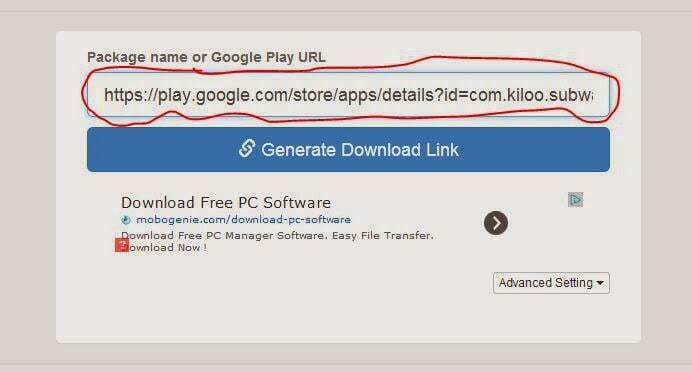 And don’t worry we will show you 2 ways to download android apk in your computer. Some apps are region specified and are not available in other regions. Thus you may want to break the region barrier. Maybe you may not have efficient mobile internet and thus you may want to use your computer to install that app. People often keep app backups in their mobile but you may want to keep backups of your apps in your computer in case of some occurance. Or it can be any reason. Thus it becomes necessary for you to learn how to download apk files from play store in your pc. So lets talk about it. There are two methods to download apps in computer. Lets talk about them one by one. There is an excellent tool online for downloading apk files from store. First Go to Evozi. After opening the url , a webpage will appear in which there will be a text box asking app url. Go to play store and open the app page which you want to download and from the address bar , copy the url. And paste that url in the Evozi webpage. Then Click on Generate Download Link Button which will generate download link for your desired app. Click on that link and download the app. Note: Don’t think to download paid apps for free using this tool as it will download only free ones. This is another free and effective tool to download android app from store in pc. Go to Freeapk. Thus here I explained two tools to download apps though still there is third method about using google chrome extension to download android app in computer but that method is too confusing thus I didn’t mention here. If you want, you can contact me. REMEMBER : You cannot download paid apps for free using above tools. So did you like it?? Please share your views in below comment and also share this in facebook to your friends and support us.